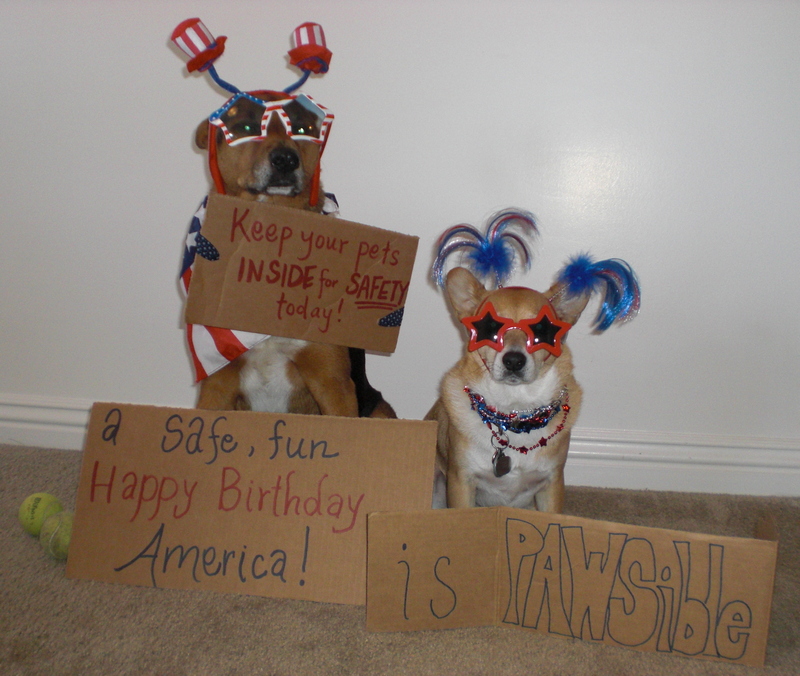 Chance and Parker’s PAWSibility #41 – A safe, fun Happy Birthday, America! Happy Birthday, America! It’s a long weekend of booming celebrations. As fun as it is for most of us humans, it is a stressful holiday for our canine family members. The plethora of parties means a lot of people coming and going. Kids continuously running inside and outside. Guests entering and exiting through the back yard gate. Friends holding the front door open for other friends with generous arms full of icy-cold 12-packs of beer, bags upon bags of chips, bowls of grandma’s potato salad, and fat, juicy watermelons. There are countless opportunities for your dog to slip out unnoticed. Even if your dog typically sticks close to home, a massive blast of echoing fireworks could send him or her running out of sheer terror. With all the craziness a celebration among family and friends can bring, you may not realize until hours afterward that your beloved dog is nowhere to be found. That’s when your stomach drops. 1. Make sure your dog is wearing his or her collar with up-to-date tags. Go check your dog right now. I’m serious. Is it on? If it is, awesome. If it’s not, go get it and put it on. Right now. Do it for your kitty, too. Hopefully, your dog is also microchipped. This is an excellent safety precaution. However, don’t use this as a reason to not put a collar with tags on your dog. A good Samaritan that finds your dog suffering heat exhaustion after hours of pounding the pavement can quickly read an ID tag. He or she may not know to take your dog to a nearby veterinarian, pet store or shelter to have your dog scanned for a microchip. 2. Keep your dog inside. Create a safe haven for your dog. Play some music or turn on the TV to help drown out the nerve-wracking sounds of firecracker explosions and whistling rockets. If you are the one hosting this year’s celebratory gathering, consider creating a stress-free ambiance in one room with the door closed and a Do Not Disturb sign on it so guests do not disrupt your dog’s peace. 3. Do not take your dog to a fireworks show. Instead, tire them out with a long walk, game of fetch, or both in the early evening. Before you leave to check out the local fireworks show, make sure your dog is secure inside the safe haven you created. The Fourth of July delivers thunderous booms from fireworks that send dogs bolting out of fear. The celebration delivers a 30 – 60 percent increase in the shelter population across the country. Don’t let your dog become part of that population jump. If you happen to spot a lost, scared dog, please be a good Samaritan. Hopefully, the dog has tags so you can quickly get him or her home. Happy Fourth of July from Chance, Parker and me!